Have you ever had an Alfajor Cookie before? How about an Alfajor Cupcake? Well today you will get to try both! These fancy cupcakes are my newest creation. Alfajor Cupcakes. Alfajores are these South American cookies, made out of cornstarch, and filled with dulce de leche. Alfajor Cookies can be dressed in many different ways. Some make them with dusted powdered sugar on top. And others might dunk the filled cookie in chocolate and have a chocolate covered alfajor cookie. 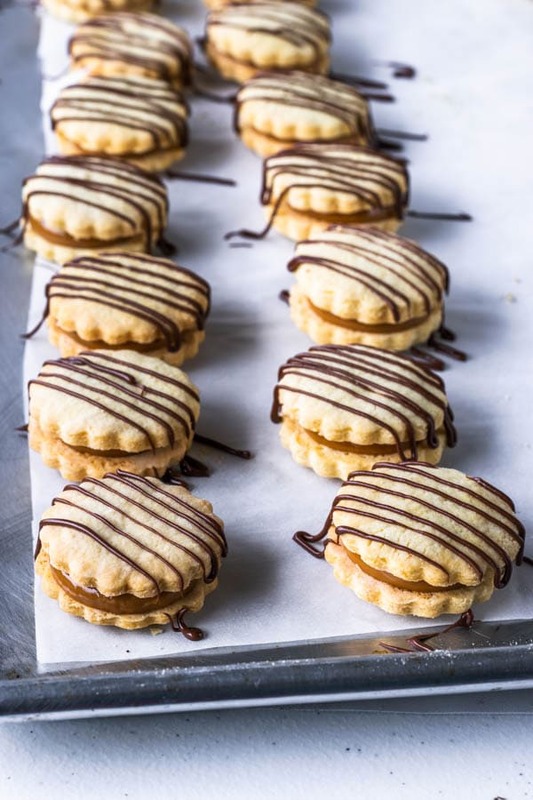 I made these Alfajor Cookies many times. And I always like to drizzle some chocolate on top of them. I just like the way it looks. The Alfajor Cookie dough can be quite crumbly, and when baked, it’s flaky, light, and delicious. You can use any cookie cutter you would like. I like my flower cookie cutters for my alfajores. 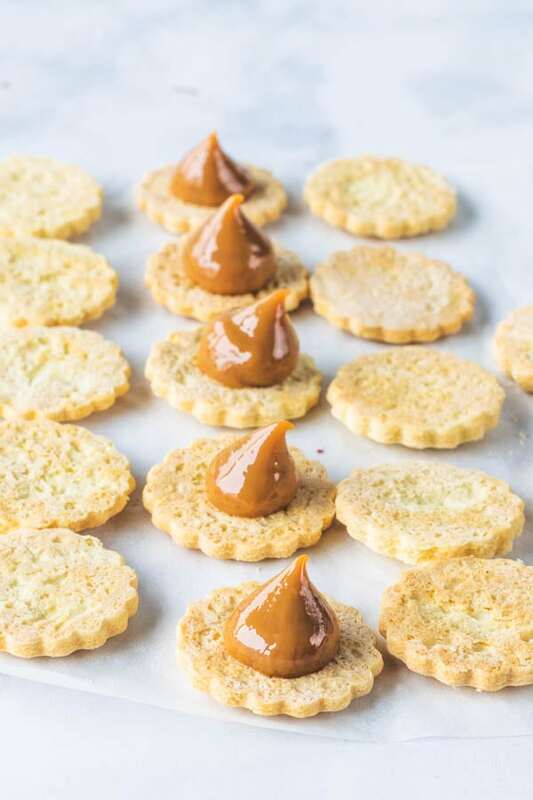 After baked, simply fill the cookies with dulce de leche. 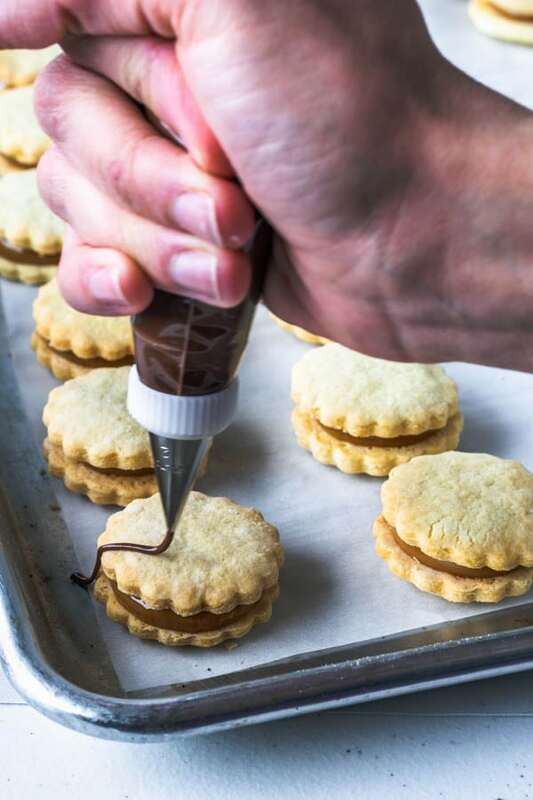 I use a piping bag to make it easier to pipe a dollop of filling right in the middle of the cookie, so this way when you place the other cookie on top to form the sandwich, the filling will be evenly distributed. And you can close them up. YUM! Now get ready to pipe some melted chocolate over the cookies. That’s how I love my Alfajor Cookies. How seriously amazing and delicious these alfajor cookies are! 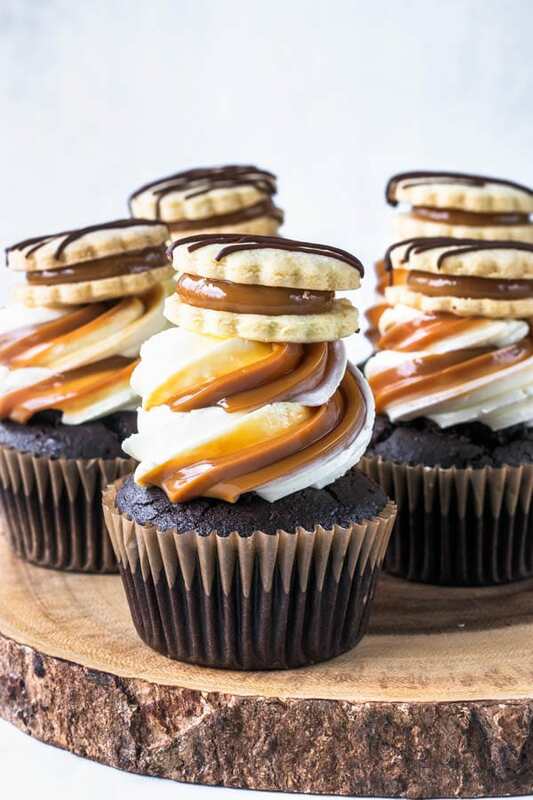 After making your cookies, they are ready to be placed on top of your Alfajor Cupcakes. Now, speaking of the Alfajor Cupcakes. 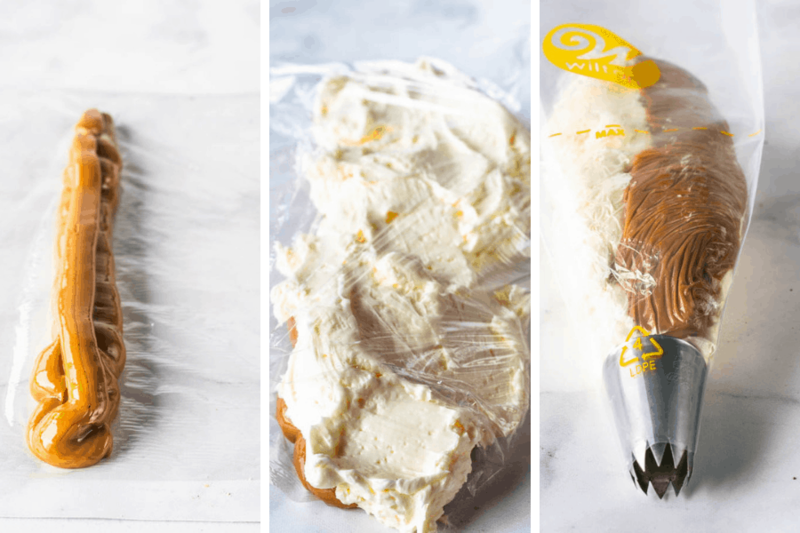 Let’s get to how to make that swirl frosting. First, before frosting the Alfajor Cupcakes, I felt like it would be fitting to fill them with dulce de leche. For obvious reasons. 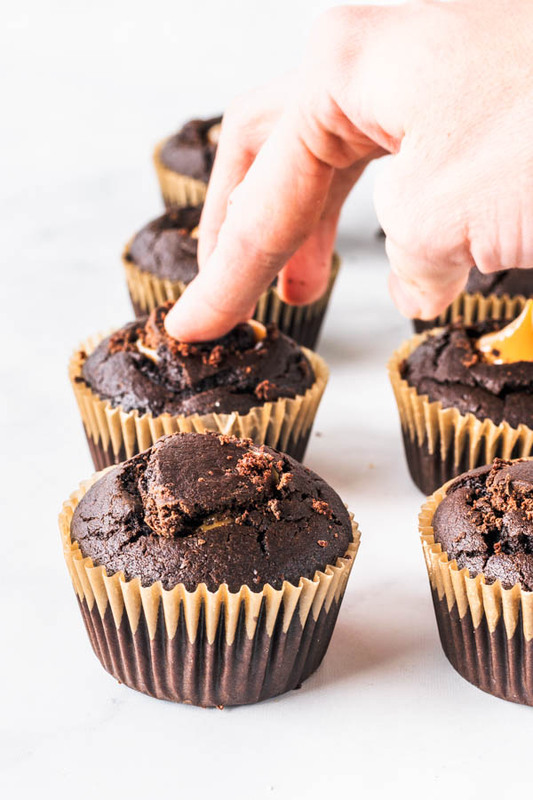 Then, place the top of the cupcake back on. Now you should be ready to pipe the frosting. Start by spreading or piping some dulce de leche over a piece of plastic wrap. Spread some of the Swiss Meringue Buttercream on top. Roll plastic over to seal it. And this is what it’s going to look like. Hold on, there’s one thing missing. Oh there it is. Perfect now! Now I want to quickly talk about the dulce de leche. 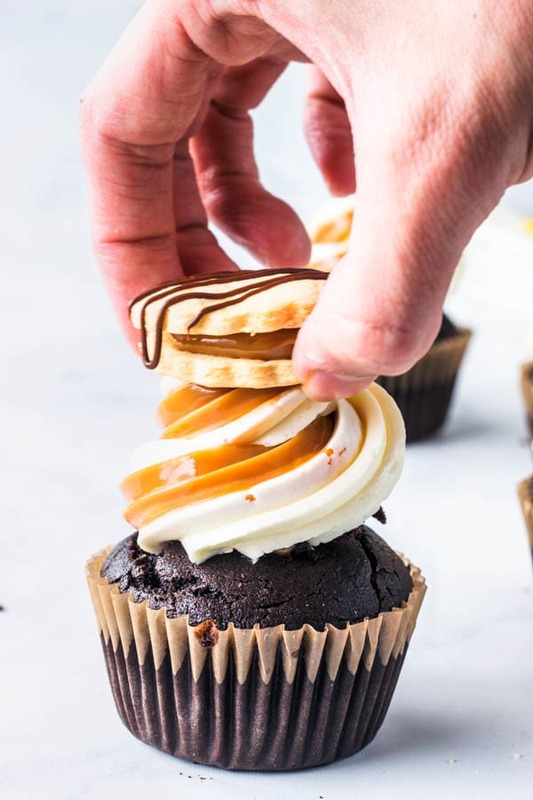 You can either use store-bought or homemade dulce de leche for the Alfajor Cupcakes. I hope you enjoyed today’s recipes and tips. 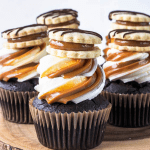 These Alfajor Cupcakes seem to be a lot of work, but they were quite a fun project! And not to mention that they are show stopper cupcakes! 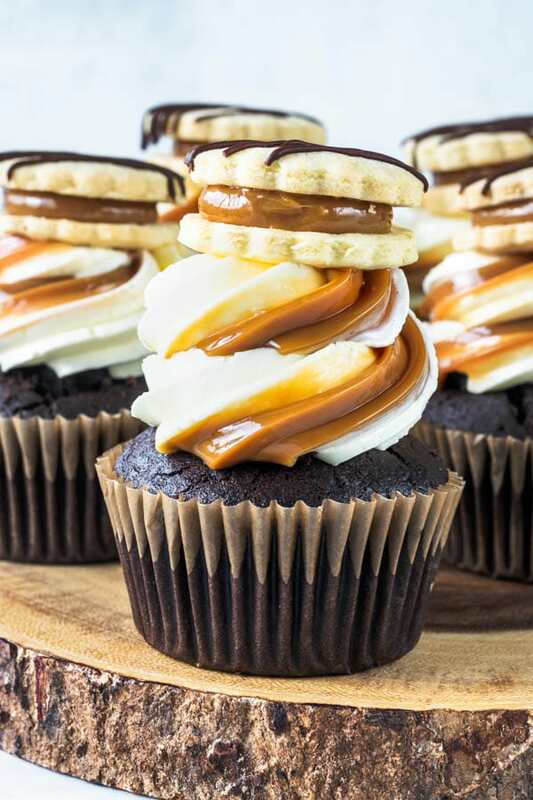 For more cupcake recipes, click here. 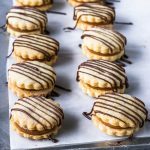 And if you would like some more dulce de leche recipes, check out my Dulce de Leche Macarons, Dulce de Leche Bars, Chocolate and Dulce de Leche Cheesecake Pie, Dulce de Leche filled Snickerdoodles. 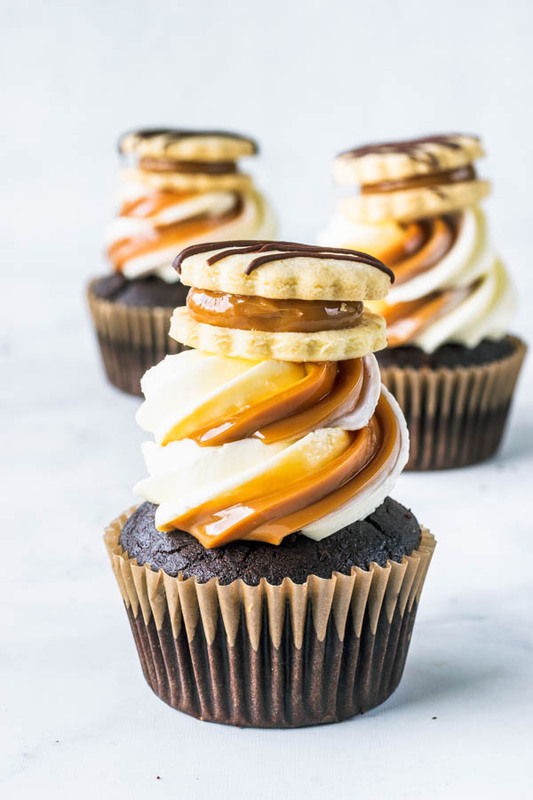 These are chocolate cupcakes, filled with dulce de leche, frosted with a swirl of Swiss Meringue Buttercream and Dulce de leche, finally topped with a cute alfajor cookie. 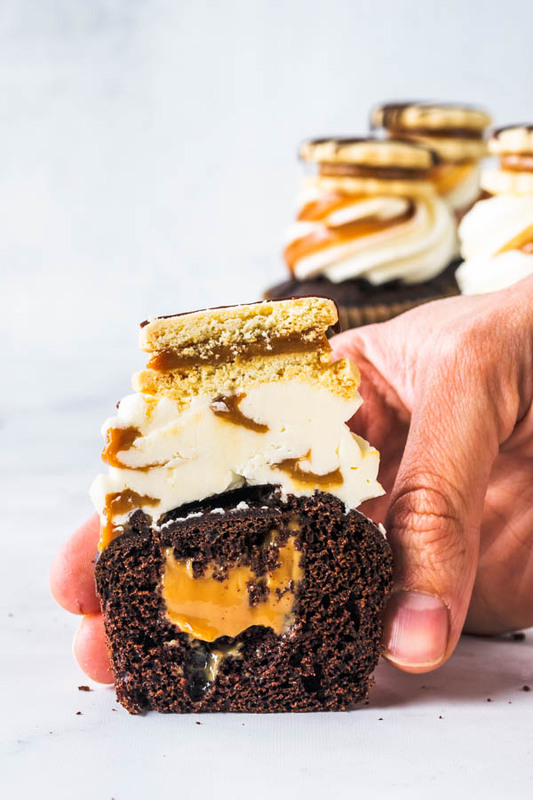 Use a spoon to remove the inside of each cupcake. 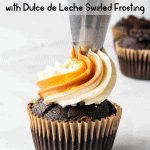 Then fill cupcakes with dulce de leche. 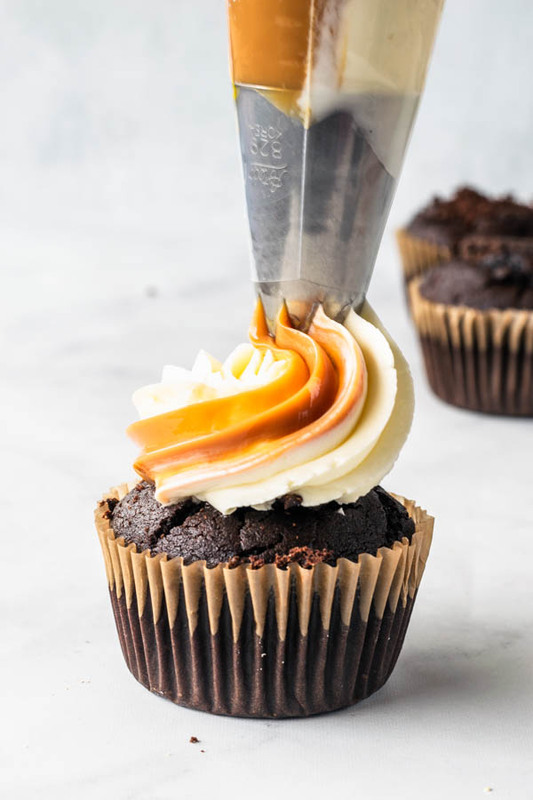 Place the top of the cupcake back to close it. Lay a piece of plastic wrap on the counter. Pipe or spread some dulce de leche over the plastic wrap (check pictures in the post above for reference), then spread some of the Swiss Meringue Buttercream on top of the dulce de leche. Roll the plastic wrap over to close. 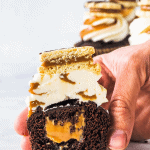 Pipe swirled frosting over cupcakes. Place an Alfajor Cookie on top. Cupcakes will be fine in the fridge, covered in an air-tight container for up to 4 days. 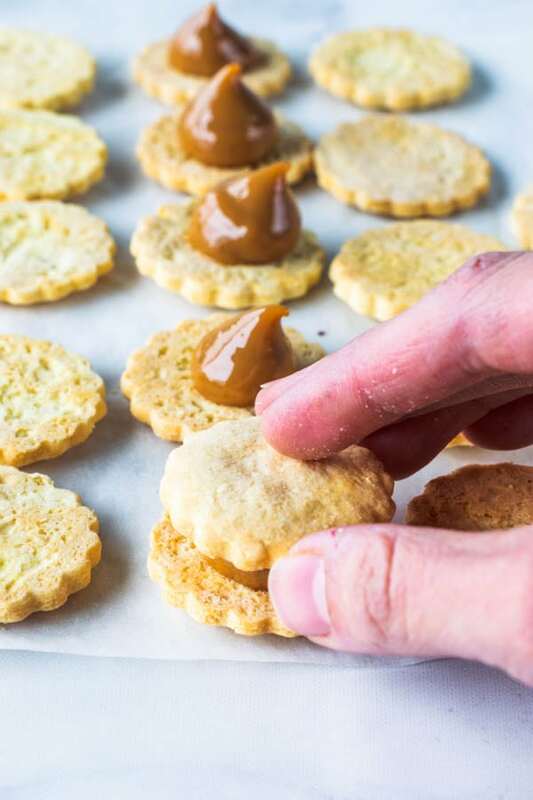 These are cornstarch cookies, filled with dulce de leche! Sift the cornstarch, flour, baking powder, baking soda and salt together. Set aside. In the bowl of an electric mixer, cream the butter at medium high speed for 1 minute. Add granulated sugar. Cream for another 1-2 minutes until very fluffy and light in color. Add egg yolks one at a time, and mix until combined before adding the next one. Add dry ingredients and mix until you form a dough. Dough should be soft and not too sticky. Wrap it in plastic or place it in a ziplock bag and chill it in the fridge for at least 3 hours. When it’s time to roll the cookies out, remove dough from the fridge and cut it into 4 pieces. Work with one piece at a time, while keeping the others covered. Roll it out until about 1/4 thick over a floured surface. Dough might be crumbly and breaking up, simply patch it back together. I used a 2.5 inch flower cutter to cut the cookies. 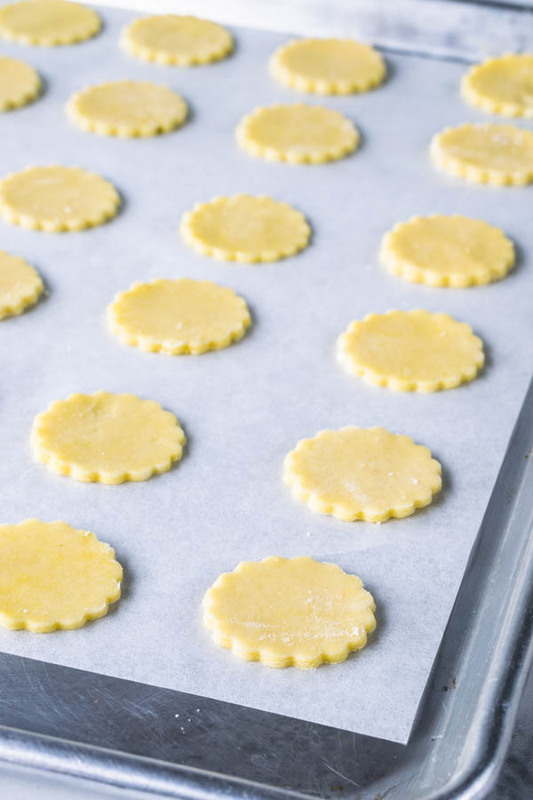 Place cookies on a baking sheet lined with parchment paper or silicone mat. Bake for 12-15 minutes. Cookies should look set, but not browned. 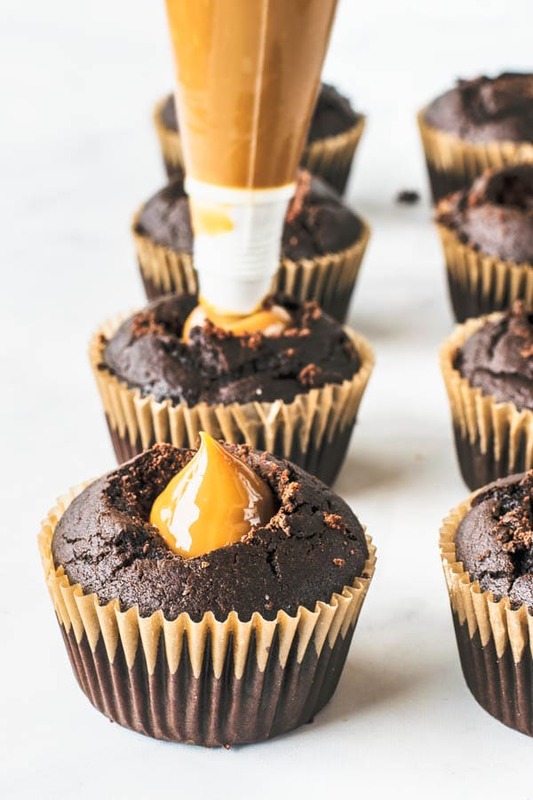 Let them cool down all the way before filling with the dulce de leche. I placed my dulce de leche in a piping bag to make it easier to fill the cookies. After filling the cookies, I melted some dark chocolate and drizzled it over the cookies. Keep cookies in the fridge for up to 5 days, in an air tight container. *You can also dust the cookies with powdered sugar, or completely cover them with chocolate. There are many variations and different ways to present your Alfajor Cookies. These sound amazing – thanks for sharing! These cupcakes are AMAZING. I had never tried Swiss meringue buttercream before, but the instructions were so easy to follow that it turned out perfectly. I will absolutely make these again, and I’m making this type of buttercream from now on. Thank you is so much!! Swiss Meringue buttercream is for sure a favorite. Im so happy you liked it! Have a great day! !